Climate change, economic and financial crises, environmental disasters, nuclear risks etc. - how many more wake-up calls do we need? We are at an important crossroads where we decide on how we behave, consume and lead our lives - and how we do business. As drastically as it sounds, the choices we make have a direct influence on the survival of large parts of society, the environment and the world at large. The bottom line is: Our individual and collective decisions determine our future and do affect all of us. 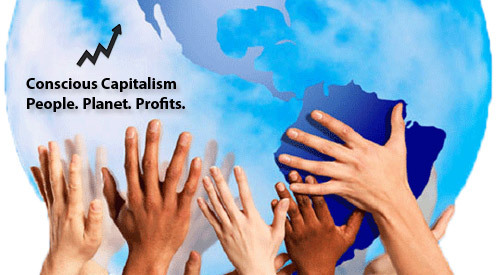 "Let us choose to unite the power of markets with the authority of universal ideals. Let us choose to reconcile the creative forces of private entrepreneurship with the needs of the disadvantaged and the requirements of future generations." There is a (r)evolution underway, an expanding consciousness: managers meditating, people seeking for purpose and standing up for their rights, leaders shaken by unpredictable crises. The "winds of change" massively affect the corporate world, too, and foster new ways of doing business more consciously. Therefore, this article explores these new ways of conscious business, the related new leadership style and required integration of IQ, EQ and SQ (spiritual intelligence). Why should we look into Conscious Business? Several years ago, I realized that I wanted to change my career from money-maximising to a profession with a purpose. I wanted to feel my lifetime well invested in positive change, meaningful work and making a difference in the world. While working for NGOs and the United Nations, I kept my interest in business because I have always been impressed by business organisations' efficiency and entrepreneurs' innovative creativity and 'can-do' attitude. However, I began to inquire into the what, why and how of business and my own actions: What are we doing? Why are we doing it? How can we do it better? So I started on the long journey of inquiry into myself, business and capitalism. I realized the importance of expanding our own consciousness to embrace positive change and achieve global sustainability. Also I recognized that there are old and new - more conscious - ways of doing business: From CSR, social entrepreneurship, inclusive business to conscious business. "We are living in a phenomenal age... finding approaches that meet the needs of the poor in ways that generate profits and recognition for business, we will have found a sustainable way to reduce poverty in the world." Here are some pointers to contrast the conventional way of doing business with conscious business. This is a simplification aiming to open up awareness by seeing an enterprises from different perspectives. Some might say that this sounds all nice but will question if conscious businesses are sustainable, profitable and competitive? Yes, they can. In fact some argue that they excel in the marketplace (see A Better Way to Win: Profiting from Purpose). After having looked at some differentiators, how can we define a conscious business? It is "a business enterprise that seeks to be aware of the effects of its actions, and to consciously affect human beings and the environment in a beneficial way." It is a value-based enterprise "where values represent social and environmental concerns globally as well as locally", i.e. go beyond economic value (see Wikipedia Conscious Business). There are no universally agreed criteria on conscious business but some accepted principles include "Doing no Harm" and the Triple Bottom Line approach of aiming for "positive value in the domain of People, Planet, and Profit". One such example is "The Body Shop" founded by activist Anita Roddick and many more examples to be explored on this blog. "We are running out of time to integrate the material and the spiritual worlds." Let me try to demystify the word 'consciousness' which fills whole PhDs in various fields. There are different levels of consciousness such as universal, collective and individual consciousness. This article focuses onto the individual consciousness, however all these levels are connected and affect each other. Your individual consciousness can be described as your awareness of your interconnectedness with everything within and around you: your own soul, co-workers, society, environment, planet, universe etc. The matrix of connections can also be seen horizontally (friends, family, colleagues etc.) and vertically ('Mother Earth" and 'Higher/God-like/Universe'). In simplified terms, consciousness is awareness and relates to your holistic, spiritual intelligence. It does not come from your knowledge or your mind, it is not determined by your IQ and it goes beyond your emotional intelligence (EQ). The closest to consciousness within the intelligence systems-thinking would be your spiritual intelligence (SQ). Conscious business requires conscious leadership which is based on all three main intelligences: IQ, EQ and SQ. SQ which is the spiritual intelligence quotient describes how well you live and lead with wisdom, compassion and peace (explore deeper at Deep Change). Conscious leadership can also be seen as integrating the various leadership dimensions from paternal, humanistic, holistic to spiritual-based (read more at Spiritual-Based Leadership Research Programme). How do body, mind, and spirit operate in me? How does that necessarily impact my role in the world of business?" Does this all matter? Yes, it is required to meet the challenges of our century and our livelihood depends on it. A conscious business values its people and therefore requires conscious leadership that inspires and brings out the best of its staff. With an expanding consciousness amongst business leaders, consumers, activists and policy makers, we are all part of a (r)evolution towards conscious capitalism. Let us jointly address the urgent issues on environmental sustainability, social justice and broad-based prosperity to ensure global sustainability. Join the movement and leave a comment. About the Author: Juergen Nagler, has worked and consulted for leading businesses, NGOs and the United Nations, blogging in personal capacity at Business4Good (biosketch).